The principal house featured in my manuscript Notorious Match, Northam Park, boasts a large parkland reaching upwards of one thousand acres. Much of it was laid out by the eminent landscape architect Capability Brown (1716 – 1783). A prophet is not without honour, save in his own country. Lancelot Brown is commended throughout the world as the master of the English landscape garden, but at home, he is frequently dismissed as a vandal who destroyed large numbers of illustrious formal gardens. Brown’s new style of gardening design eschewed carefully trimmed hedges and formal flower gardens (think Hampton Court) for a more natural environment with grass-covered undulations leading down to carefully installed lakes and trees. The effect was beautiful, providing a panoramic view from the great Palladian houses being built as country residences for the wealthy. One of the charactertistics of this new landscaping style was the garden temple, an outdoor feature normally given a classical design although many favored a more Gothic bent with the rise of Romanticism. These would be placed not far from the main house, but within the natural setting of these “gardenless” gardens. From them, you could look across the estate through a long-viewer while keeping your eye on the children as they bowl on the manicured lawn nearby. 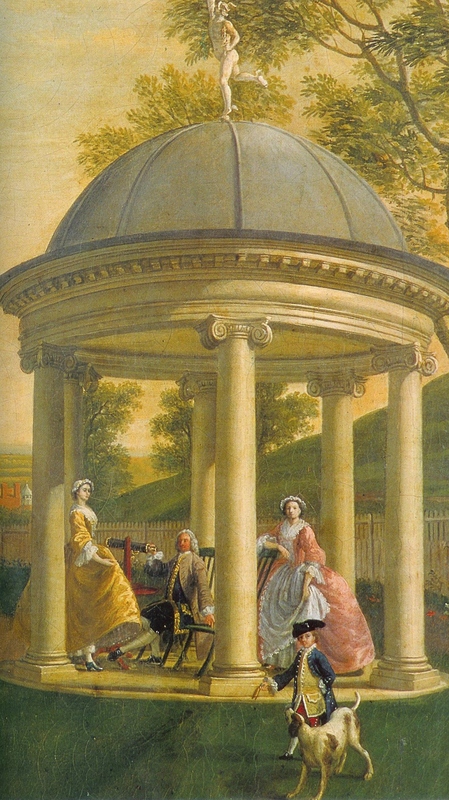 Many times these beautifully designed structures were simple rotundas, like the one pictured above from Beachborough House in Kent in a painting attributed to Edward Haytley, circa 1745. Several, like the one at Northam Park, were much more grand and served a variety of functions–greenhouses, etc. I particularly adore the lovely one used for the shooting party lunch in Robert Altman’s mystery Gosford Park (2001) at 1:40. Clive Owen, anyone? Yes, please. Northam Park’s landscape feature is called Diana’s Temple. It is very similar to the one of the same name at Weston Park, pictured below. For a wonderful view of the restored interior, with its remarkable plasterwork, see this exquisite photo from Country Life. It looks just like a piece from someone’s blue Wedgewood collection. 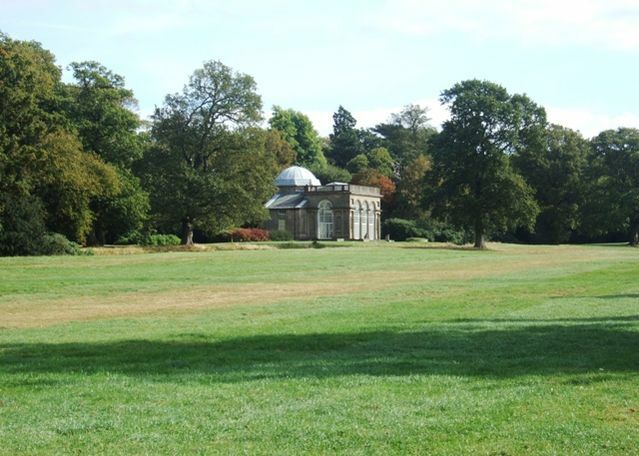 This temple was designed by James Paine (1717-1789) who also designed the stables at Chatsworth House. This entry was posted in Notorious Match, Regency, Uncategorized and tagged Beachborough House, Capability Brown, Edward Haytley, Gosford Park, James Paine, Weston Park by Angelyn. Bookmark the permalink. Wonderful blog on English gardens. The Gosford Park trailer was a nice touch. What a cast!